Like Oregon helmets, Star Wars has had some greats and not-so-greats through the years. Episode I- The Phantom Menace was the worst Star Wars film and is awarded Oregon's ugliest helmet of all time, the Vegas Bowl Dome. Episode II- Attack of the Clones was another terrible film and gets the Bubble Gum Breast Cancer Helmet award. Episode III- Yet another terrible Star Wars Film. 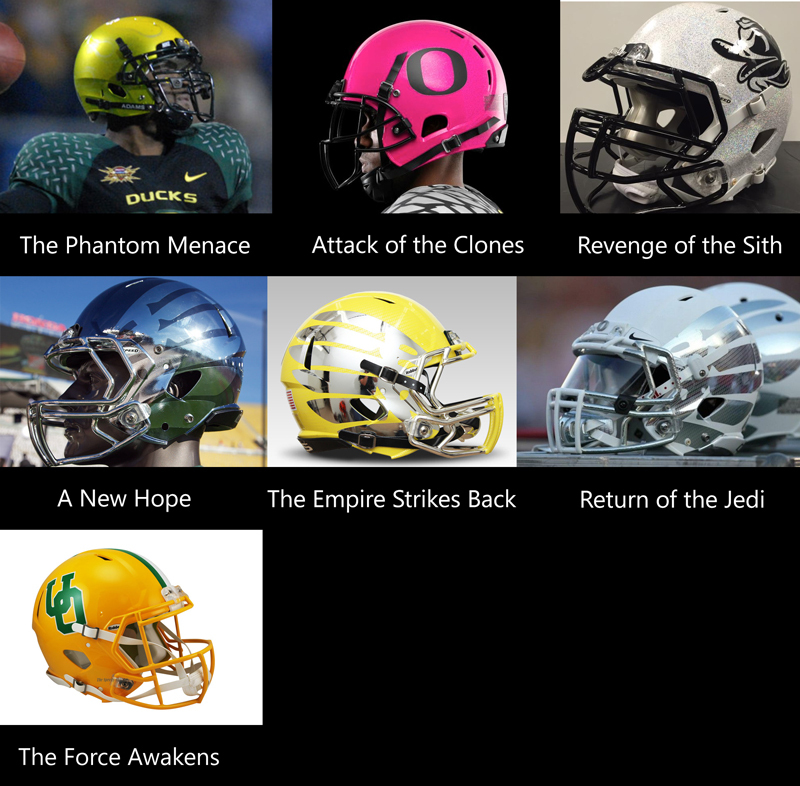 2015 was the year of ugly Oregon helmets. There were a lot of potential choices here. None were quite as bad as the Vegas Bowl Dome or the Bubble Gum Top, but it's easy to see why the Duck is so angry on the 2015 Angry Duck Glitter Topper. Congratulations Revenge of the Sith. Episode IV - A New Hope. This is a film that would become a movie juggernaut. It's the way Star Wars should look and feel, and Oregon found that revolutionary look and feel with the help of HydroGraphics with the winged Chrome Helmet. You can go blind from the glare of the reflection of the Death Star blowing up. Episode V - The Empire Strikes Back is arguably the best Star Wars film made to date. Keeping with the winged design, fans of Oregon love the inclusion of team color yellow to the winged-helmet family. Episode VI - Return of the Jedi may not have been as great as the previous two films, but it's still cool and way better than episodes 1, 2, and 3. It looks and feels like Star Wars, so it will get the winged design as well. Most any of the other winged helmets could have fit here, but got to go with some Storm Trooper love on this. Episode VII - The Force Awakens is meant to erase the catastrophe of the prequels. It is meant to go back to the roots and please angered Star Wars fans. Although it's not a winged helmet, the modernized throwback helmet of Oregon is a crowd pleaser, meant to pay tribute to the past. The Force Awakens may have not been the most inventive of stories, but it reestablishes an old look and feel that fans can't stop raving about. Within different contexts, however, a universality must apply. If it does not, that particular use of the signifier would appear either inappropriate, or misleading.